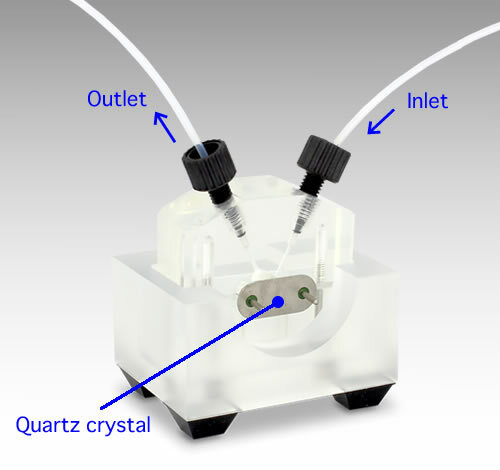 The quartz crystal microbalance (QCM) technique under electrochemical frequency is very useful to determine many compounds such as metal proteins, metal ions and thiol-conjugated oligonucleotides. The Resonance frequency of quartz changes when material attaches to the surface of the electrode. This product is capable of super-micro quantitative analysis by using this unique behavior. 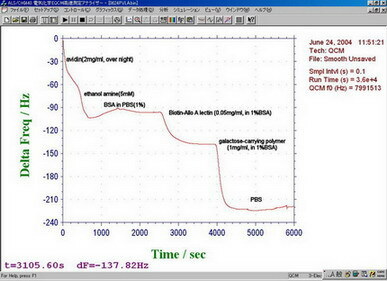 Baseline is stable enough as shown in figure. 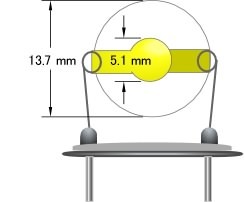 Thickness of 10 MHz quartz is 0.16 mm. 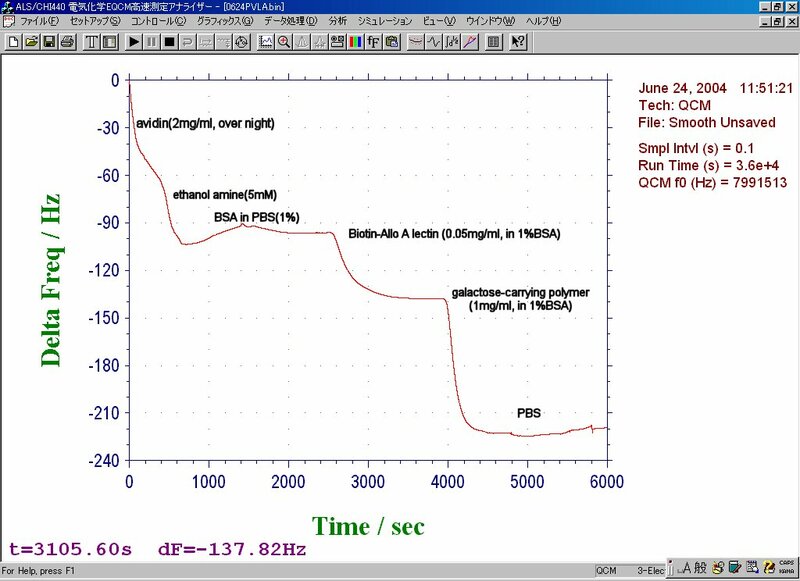 Accelerating the oscillation frequency means to make the quartz thinner and delicate. Resolution and easiness to care for should be taken into the consideration. We can offer two surface conditions of quartz - Polished and Unpolished. Polished one has a 100 Å thickness of gold layer on a titanium adhesive layer. We would recommend the unpolished quartz if there is a possibility that the titanium layer might effect on your experiment. We would like you to note that the gold layer on the unpolished quartz peels off easier than the polished one because it does not have adhesive layer. 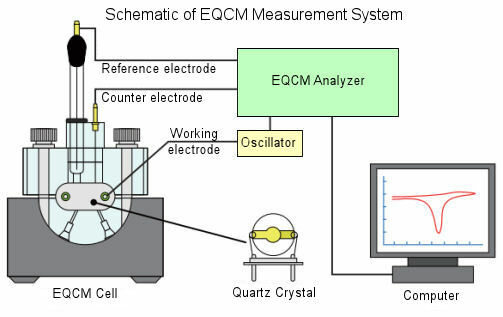 EQCM is useful for a variety of the research of the phenomena occurring at the electrode surface, as the adsorb and desorb of the electrode reaction product and electrolytic deposition of the metal. Reversing the QCMT flow cell kit, it can be used as EQCM cell. 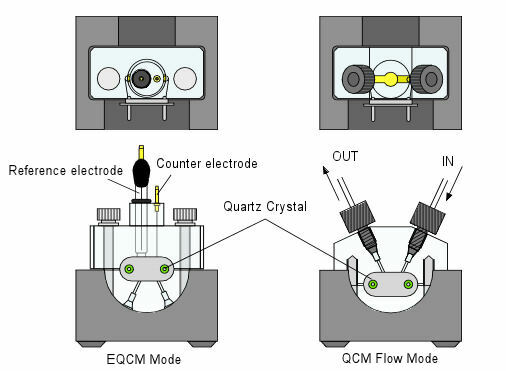 When EQCM electrodes (quartz crystal) as a working electrode is used in the electrolysis, the mass changes that occur on the electrode as a frequency change during the electrolysis can be measured simultaneously. 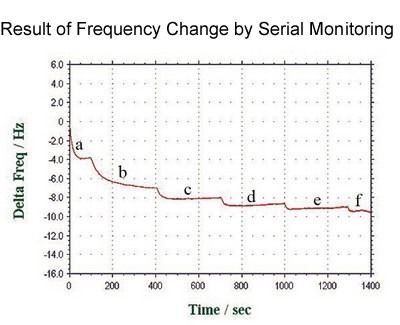 When cyclic voltammetry (CV) and frequency changes are measured at the same time, it is possible to investigate the current and mass changes that occur at the electrode surface. Also, frequency changes can be measured, at the same time, with linear sweep voltammetry (LSV), chronoamperometry (CA), amperometry (i-t), and Chronopotentiometry (CP) .